Kazakh horses in North Central Kazakhstan. Photo: Ludovic Orlando, Natural History Museum of Denmark, CNRS. Researchers who delved into the DNA of 13 stallions who lived around 2500 years ago have found evidence that highlights the dramatic loss of genetic diversity in the horses of today. The international team of researchers found support for what they called a significant demographic collapse during the last 2300 years which has resulted in an important reduction of genetic diversity within modern domesticated horses. This is due to mankind’s reproductive management of horses over the last two millennia, led by the use of fewer stallions. The study, the findings of which have been published in the journal Science, took advantage of exceptionally preserved horse remains in royal Scythian burials. Nomad Scythian herders roamed vast areas spanning the Central Asian steppes during the Iron Age, from around 900BC to 100BC. They were livestock pastoralists, who lived on wagons covered by tents. They had exceptional equestrian skills and left their mark in the history of warfare. They were among the first to master mounted riding and to make use of composite bows while riding. The royal Scythian tombs provided a rich vein for the researchers to explore. 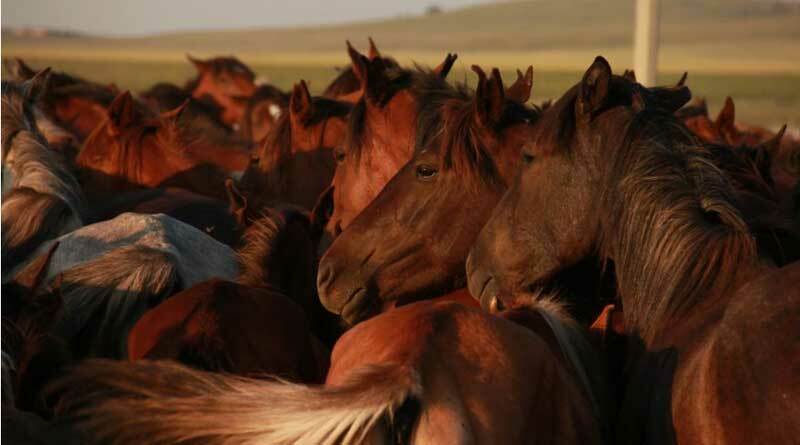 One, at the site of Arzhan, in Russia’s Tuva Republic, contained 200 horses. Another, at Berel, in Kazakhstan, contained no fewer than 13 horses preserved in a single permafrozen funerary chamber. Applying the latest methods in ancient DNA research, the researchers were able to sequence the genome of 13 Scythian stallions. These were 2300 to 2700 years old and included 11 specimens from Berel and two from Arzhan. The researchers also sequenced the genome of one 4100 year-old mare from Chelyabinsk, in Russia, belonging to the earlier Sintashta culture, which developed the first two-wheeled chariots drawn by horses. Using the DNA data, the team of 33 international researchers from 16 universities, led by Professor Ludovic Orlando, were able to identify the suite of traits that Scythian breeders selected to engineer the type of horse that best suited their purposes. The DNA variation observed at key genes revealed a large diversity of coat coloration patterns within Scythian horses, including bay, black, chestnut, cream and spotted animals. Scythian horses did not carry the mutation responsible for alternate gaits and, as a consequence, were not natural amblers. However, some but not all individuals carried variants associated with short-distance sprint performance in present-day racing horses. This indicated that Scythian breeders valued animals showing diverse endurance and speed potential. The study team found that the genes involved in mammary gland development and function included variants linked to greater milk production, pointing to the possibility that the Scythians milked their horses. The Scythian Kurgan burial site at Arzhan in the Tuva Republic, Russia, dating from the 7th century BC. This is grave 16, showing the unearthed skeletons of 14 horses. Photo: Michael Hochmuth, German Archaeological Institute, Berlin. “With the exception of two horses, none of the animals were related,” said Dr Pablo Librado, a post-doctoral researcher at the Centre for GeoGenetics at Denmark’s University of Copenhagen, and co-leading author of the study. The absence of inbreeding suggested that Scythian breeders succeeded in maintaining natural herd structures and did not perform selection through a limited number of valuable lineages. This contrasts with modern management practices where single stallions can be used to father hundreds of offspring. Patterns of genetic variation along the genome also revealed a total of 121 genes selected by Scythian breeders, most of which are involved in the development of forelimbs. This indicated that Scythian breeders selected horses showing more robust bone structure. Orlando, who is professor of molecular archaeology at the Centre for GeoGenetics at the University of Copenhagen, said the research team wanted to go beyond the myth of Scythians being aggressive warriors, drinking the blood of their enemies in skull mugs. The genome data set generated in the study also revealed important lessons for the history of horse management, which started some 5500 years ago, and animal domestication as a whole by contrasting patterns of genetic variation in ancient and present-day horses. By contrasting patterns of genetic variation in ancient and present-day horses, the authors found support for a significant demographic collapse during the last 2300 years, which resulted in an important reduction of genetic diversity within domesticated horses. During the same time period, reproductive management has involved a diminishing number of stallions, up to the point that, today, almost all domesticated horse virtually carry the same, or highly similar, Y-chromosome haplotype(s). The authors also found that the demographic collapse and loss of Y-chromosomal diversity observed within the last 2300 years was mirrored by a significant accumulation of harmful mutations in the horse genome. As these mutations reduced the fitness of their carriers, it showed that the last two millennia of horse management have negatively impacted the horse. However, early domestication stages, as represented by the Sintashta and Scythian genomes, did not have such an impact. This contrasts with the cost-of-domestication hypothesis, which posits a negative impact starting from early domestication stages. In the case of horse domestication, it is likely that the demographic collapse within the last 2000 years reduced the effectiveness of negative selection to purge out harmful mutations, which could then accumulate in the horse genome. “The neural crest hypothesis proposes a unified model for the origin of similar traits commonly found in most domestic animals,” explained Orlando. “As the neural crest represents a temporary group of cells during development which gives rise to many tissues and cell lineages, selection for genetic variants affecting the neural crest can almost in one go co-select for a range of traits.